Palliative care in cancer patients requires a continuous reprioritization of effort. This review describes the need for this reprioritization and uses smoking cessation as a case-in-point. The treatment of patients with metastatic non-small cell lung cancer has changed dramatically in the past few years. Interestingly, patients who had previously smoked now have an improved prognosis—for a variety of reasons. 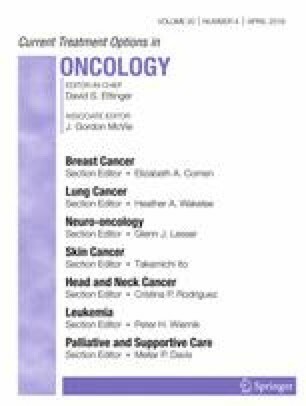 This review discusses this last observation in detail and raises the question of how forcefully we should advise smoking cessation in patients with incurable metastatic non-small cell lung cancer. Konstantinos Leventakos, Anna J. Schwecke, Erin Deering, Elizabeth Cathcart-Rake, Anna C. Sanh, and Aminah Jatoi declare that they have no conflict of interest. https://www.cancer.net/navigating-cancer-care/prevention-and-healthy-living/stopping-tobacco-use-after-cancer-diagnosis; last accessed January 22, 2019.
https://www.cdc.gov/tobacco/data_statistics/fact_sheets/cessation/quitting/index.htm; last accessed January 22, 2019.